The economic survey 2017 predicts that demonetisation has been a radical, unprecedented step with short term costs and long term benefits. 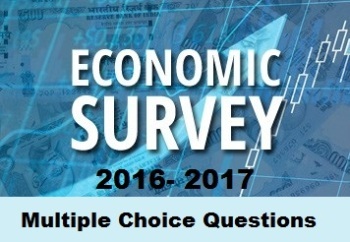 Hence, we provide Economic Survey 2017 questions on demonetisation for IAS Prelims 2017. The Finance Ministry of India presents the Economic Survey in the parliament every year, just before the Union Budget. According to the survey via demonetisation government announced a historic measure, with profound implications for the economy. 3) To stop the use of low denomination notes for terrorist activities. 4) To discourage the accumulation of “black money”. Which of the above statements is the correct aim? On November 8, 2016, the government announced a historic measure, with profound implications for the economy. The two largest denomination notes, Rs 500 and Rs 1000, were “demonetized” with immediate effect, ceasing to be legal tender except for a few specified purposes. The aim of the action was fourfold: to curb corruption; counterfeiting; the use of high denomination notes for terrorist activities; and especially the accumulation of “black money”, generated by income that has not been declared to the tax authorities. 1) There were two previous instances of demonetisation, in 1946 and in 1978. 2) Demonetisation instance in 1946 didn’t have any significant effect on cash circulation in the country. 3) All before demonetisations have occurred in the context of hyperinflation, wars, political upheavals, or other extreme circumstances. India’s demonetisation is unprecedented in international economic history, in that it combined secrecy and suddenness amidst normal economic and political conditions. All other sudden demonetisations have occurred in the context of hyperinflation, wars, political upheavals, or other extreme circumstances. India’s action is not unprecedented in its own economic history: there were two previous instances of demonetisation, in 1946 and 1978, the latter not having any significant effect on cash. But the recent action had large, albeit temporary, currency consequences. For 2016-17, the annual percentage changes in currency are expected to be only 1.2 percent year-on-year, more than 2 percentage points lower than four previous troughs, which averaged about 3.3 percent. 3. India has given a whole new expression to unconventional monetary policy. Why India’s monetary policy would be considered a “helicopter hoover”? a. India’s monetary policy is focussed on expanding the money supply. b. India’s monetary policy on demonetisation has reduced the money supply. c. India’s monetary policy on demonetisation will largely expand the money supply. In the wake of the Global Financial Crisis (GFC), advanced economies have used monetary policy to stimulate growth, stretching its use to domains heretofore considered heretical such as negative interest rate policies and “helicopter drops” of money. In fact, India has given a whole new expression to unconventional monetary policy, with the difference that whereas advanced economies have focused on expanding the money supply, India’s demonetisation has reduced it. This policy could be considered a “reverse helicopter drop”, or perhaps more accurately a “helicopter hoover”. 4. Which of the following is another earlier effort (before demonetisation) to curb illicit activities like black money, terrorism funding, corruption and counterfeiting? Demonetisation was aimed at signalling a regime change, emphasising the government’s determination to penalise illicit activities and the associated wealth. In effect, the tax on all illicit activities, as well as legal activities that were not disclosed to the tax authorities, was sought to be permanently and punitively increased. It followed a series of earlier efforts to curb such illicit activities, including the creation of the Special Investigative Team(SIT) in the 2014 budget; the Black Money and Imposition of Tax Act 2015; Benami Transactions Act 2016; the information exchange agreement with Switzerland; changes in the tax treaties with Mauritius, Cyprus and Singapore; and the Income Disclosure Scheme. 5. According to the economic survey 2017, what percentage of cash in circulation was rendered invalid due to the demonetisation action? At one fell stroke, 86 percent of the cash in circulation was thereby rendered invalid. These notes were to be deposited in the banks by December 30, 2016, while restrictions were placed on cash withdrawals. In other words, restrictions were placed on the convertibility of domestic money and bank deposits.